This article is about the figure. For the constructable, Ultrabuild action figure based on , see 70201 Eris. 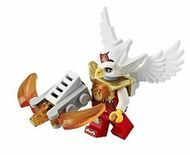 Eris is a Legends of Chima minifigure released in 2013. She is Laval's best friend, and a major character in Legends of Chima: The Animated Series and Laval's Journey. 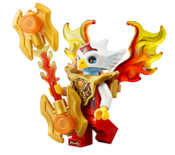 Eris has a torso and belt with light blue skin, like the head-piece under the eagle ‘helmet’; white arms and legs; and hands of flame yellow. On her ‘toes’, she has markings like those of eagle talons. She has golden printing on her knees, and also on her belt. Her ‘helmet’, white in base colour, has a flame yellow beak, eyeholes, and a golden crown with a blue stone in the middle; three ‘prongs’ rise from the back. Her eyes, revealed through the eyeholes, are orange. Over her torso, she wears a golden shoulder armour piece with a transparent light blue flat-stud piece in the middle. White eagle wings connect to the back. Her torso has a belly button, and a golden top to cover her chest. However, in the set 70009 Worriz's Combat Lair, she wears a new 2013 armor piece which is also seen on Lagravis in set 70010 The Lion CHI Temple. Though strategic and focused like most other eagles, Eris is also capable of thinking quickly. Eris is kind and a loyal friend. She is a good storyteller and loves to tell jokes, even though her friends do not usually find them funny. Eris is best friends with Laval and prefers his company to that of most other eagles. In battle, she wields Eglaxxor, a battleaxe-like weapon with a brown shaft, a golden head, and flat blue studs on either side. Though not particularly strong, she makes up for this handicap with intelligence, strategy, and surprises. Since she is capable of flight, she can dominates her opponents by attacking from the sky. When the Wolves attack Eagle Spire, Eris is taken captive by Wiz just as Laval arrives. She is ushered to the top of the Spire and held hostage until Laval manages to rescue her. She and Laval make their way through the eagle town, defeating the invading wolves along the way. Eris is a rather timid young eagle. She doesn't really prefer face-to-face battles, but instead she likes to assists her friends from the sky in her Interceptor. As a best friend to Laval, Eris acts as the mature one. Always advising Laval about the right things to do and what best to avoid. Her timid nature usually commented by Laval that Eris should be more 'lighten up' and to not spoil the fun. Eris is a bit 'blunt'. When Rogon keeps straing at her with 'weird faces', she never noticed that Rogon actually likes her, that is, until Laval saw Rogon's carved slad with a picture of him and Eris inside a heart. Laval explained to her that Rogon like her, Eris was shocked by the proclamation, as she never thought that Rogon could ever like her. In the episode Chima Falls, she breaks up with Rogon because he turned against Laval because of Craggers influnce and free rocks. While many Eagle Tribe members can be a bit “airheaded,” Eris is always extremely focused and quick-witted, which is probably why she spends more time with the earth-bound creatures (like Laval) than those who live in the clouds. She loves adventures and puzzles, and can spin a yarn like no other creature. She is also an extremely strategic fighter. What she lacks in strength she makes up for with smarts. You have to fight Eris with both your body AND your mind because she always has a trick or two up her wings. She’s never mean-spirited... unless provoked. Typically, she’s the first to lend a hand, and the last to leave a friend in need. You can always count on Eris. Just don’t let her corner you and tell you jokes – a lot of them aren't as funny as she thinks they are. Eris has quoted Wonder Woman on several occasions. Eris until 2015 is the only female Legends of Chima character to appear in more than on set. Besides Maula, she is the only main female character of a tribe. "Eris Vs Black Cloud - Rematch"
"Big Boys with Big Toys"
Eris While many Eagle Tribe members can be a bit “airheaded,” Eris is always extremely focused and quick-witted, which is probably why she spends more time with the earth-bound creatures (like Laval) than those who live in the clouds. She loves adventures and puzzles, and can spin a yarn like no other creature. She is also an extremely strategic fighter. What she lacks in strength she makes up for with smarts. You have to fight Eris with both your body AND your mind because she always has a trick or two up her wings. She’s never mean-spirited... unless provoked. Typically, she’s the first to lend a hand, and the last to leave a friend in need. You can always count on Eris. Just don’t let her corner you and tell you jokes – a lot of them aren't as funny as she thinks they are. This page was last edited on 16 July 2016, at 17:18.